Belitsoft has developed a modern SP-based data management system and helped the client migrate to it. Belitsoft was hired by an insurance company from the UK. The client’s employees were not performing as well as they could because of the outdated BPA system. So the company needed a new one that fit their current business processes. Due to the size and urgency of the project, creating a detailed requirements document in advance was suboptimal. So the Time and Material model and Agile methodology seemed like the best fit. The work was split into 3-week sprints with a demo session at the end of each. This helped keep the customer confident about having his money well-spent. One of the client’s managers acted as a point of contact for our development team and participated in meetings via Skype. We have integrated the client’s broking application (Brokasure) with an Azure app and Sharepoint. As a result, the document management system automatically creates the necessary collections for every unique Associate ID. Each site collection contains custom document libraries with specific structure, SPFx Application and Field customizer extensions. The SharePoint tenancy may vary based on the Legal Entity of document being added. 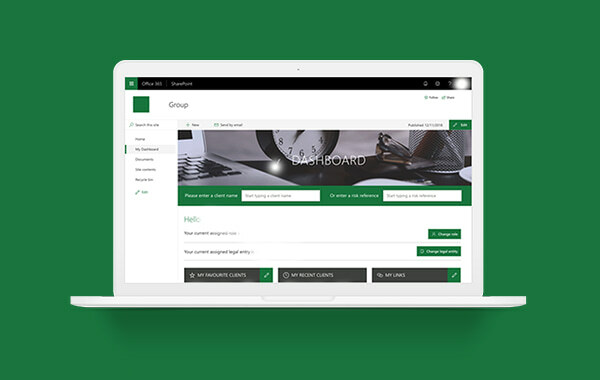 We have also created a Sharepoint Hub Site to improve navigation and make the users’ day-to-day work more convenient. The client was impressed with the results and decided that there is more room for improvement at his company. So Belitsoft team is still working on improvements and extra features for the document management system.